The Larson Electronics HAL-24-2L-LED-BMSW-D-V2 Hazardous Area Dimmable LED Light Fixture is U.S./Canada UL Listed Class 1 Division 2 Groups A, B, C and D - UL 1598A listed, has a T4A temperature rating and ideal for hazardous locations where flammable chemical/petrochemical vapors may be occasionally encountered. The HAL-24-2L-LED-BMSW-D-V2 fixture is a 2 foot long, 2 lamp, UL listed Class 1 Division 2 Groups A, B, C and D hazardous area LED light that takes the reliability and efficiency of a fluorescent fixture and adds even longer lamp life and efficiency with high output LEDs. This fixture is T4A temperature rated and comes standard with our high power 14 watt LED lamps. The lamps are protected by a powder coated aluminum frame and shatter and heat resistant clear acrylic lens secured with four zinc coated steel draw latches. This LED light fixture features 0-10V dimming capabilities. This gives operators the ability to manually adjust the brightness of the LED lamp quickly and easily. The 0-10V dimming allows for adjustments to fit the brightness needs of any lighting situation. A 0-10V dimmable light works through the use of a DC control signal that ranges between zero and ten volts. The basic idea is that at 10 volts of input the light is at its brightest level with 0 volts being the lowest possible dimness setting. The smooth, continuous and flicker-free dimming of a 0-10V dimmable LED light is ideal for a wide range of different lighting applications. The fixture is constructed of copper free aluminum alloy and powder coated. The lamp reflector is corrosion resistant heavy gauge aluminum and coated with a high gloss reflective finish. This fixture can be configured to run on 120 to 277VAC as well as 12-24VDC and is U.L. 595 and UL 1598A Marine Type approved for use marine environments. The HAL-24-2L-LED-BMSW-D-V2 is weatherproof and provides operators in hazardous locations with a highly efficient, reliable and affordable lighting solution for open areas where flammable chemicals and vapors may occasionally be present. We have eliminated the ballast normally associated with fluorescent fixtures which reduces overall weight, increases lamp life to an extreme 50,000 hours and helps this LED fixture maintain a T4A temperature rating. The solid state design of the included LED lamps give this fixture superior resistance to damage from vibrations and extremes in temperature as well as a lamp service life over twice that of standard T8 bulbs. The 14 watt LED lamps produce more illumination than standard T8 bulbs, but draw only 3/4 of the current. The current generation of Larson Electronics LED T-series style bulbs produce 15% more light than standard T8 bulbs. 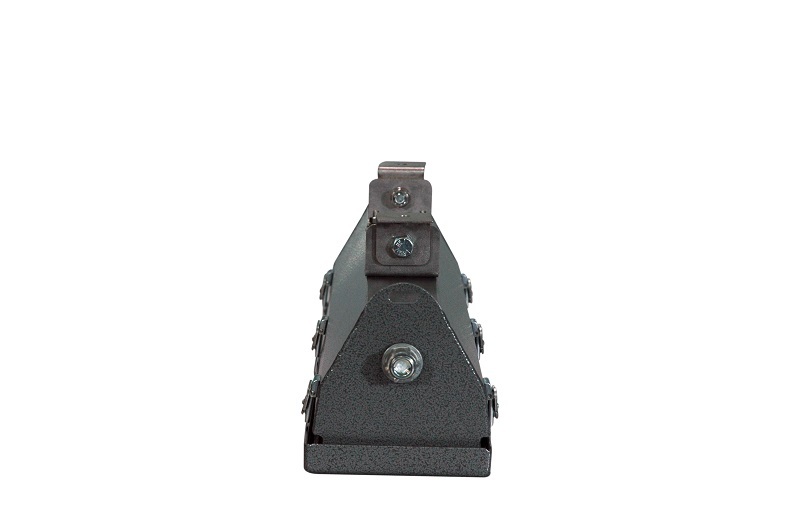 This fixture is multi-voltage capable (not multi-tap) and works on the following voltages: 120 Volt 60 HZ, 220 Volt 50 HZ, 240 Volt 60 HZ, 277 Volts 60 HZ. We also make a 12-24V DC version for low voltage applications (-LV suffix). Our HAL-24-2L-LED LED light fixture is both U.S. and Canada UL Listed. Standard Surface Mount Brackets: Each L bracket is cinched to the bracket mounting peg on each side of the light. The angle of the bracket is set by tightening two bolts on either side of the bracket. The bolts act as a set screw. The bracket itself is mounted via a single bolt hole at the top the bracket. There are two brackets. Once the brackets are mounted to a surface (ceiling, floor or wall), the light fixture can be pivoted by loosening the that hold the bracket to the mounting peg. This fixture allows 45 degrees of pivot from the 90 degree point.